The Kyocera Mita KM-1510 is a desktop copier/printer developed by Kyocera for home and small office use. The Kyocera Mita KM-1510 brings to the table dependable performance for its consumer niche, and also affordability and cost-effectiveness in print and copy costs that have been a signature among Kyocera’s line of printers and copiers. Featuring a simple yet elegant design that will surely complement any working environment and remarkable usability, the Kyocera Mita KM-1510 is one reliable office or home companion for print and copy needs. The Kyocera Mita KM-1510 possesses modest speeds for its copy and print functions, with 15 copies per minute and 18 pages per, respectively. Output speed for initial copy is fast at only 6.3 seconds, with warm up time at approximately below 30 seconds. With an optional 16 MB RAM for its copier memory, the Kyocera Mita KM-1510 can handle simultaneous tasks with ease and efficiency. It’s also capable of producing fast prints that carry 1200 dots per inch (dpi) resolution, a feat not usually found among copier/printer combination machines. 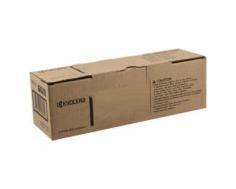 For its copy function, the Kyocera Mita KM-1510 has a 600 x 600 dpi, with halftone levels set at 256. Magnification is also an available feature, with 4 preset ratios, 2 each for reduction and enlargement, and a 50-200% zoom capability. The Kyocera Mita KM-1510 is powered by an embedded PowerPC405 that carries 200 MHz processor, adequate enough to handle simultaneous print jobs. Its memory is set at a default 8 MB, though it can be upgraded to 136MB for increase performance in handling multiple tasks. Upgrade for memory is through a standard CF card slot. As with other desktop printers of Kyocera, the Kyocera Mita KM-1510 has an impressive PDL and emulation support, with PRESCRIBE, PCL6, KPDL2, IBM ProPrinter and Epson LQ850 to name a few. The Kyocera Mita KM-1510 also has an optional network capability, which features the standard 10/100 Base TX and an enhanced Wireless NIC, perfect for a small workgroup. Network protocols that are supported by the Kyocera Mita KM-1510 include TCP/IP, AppleTalk and NetBEUI. The Kyocera Mita KM-1510 is also a versatile printer/copier combo, able to support operating system platforms of Windows, Linux and MAC through its dedicated drivers. Utilities include KM-Net Viewer, Remote Operation Panel, Network Advance Setup utilities and PRESCRIBE utilities that significantly enhances Kyocera Mita KM-1510’s performance and usability. Copy functions for the Kyocera Mita KM-1510 include imaging modes such as text, photo, manual and auto copy options and ECO mode for a more power-friendly production. 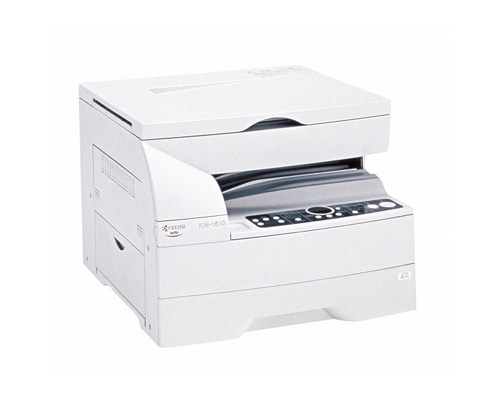 The Kyocera Mita KM-1510 also features a continuous copy option of up to 99 copies, with an auto reset to 1 function. Paper handling for the Kyocera Mita KM-1510 utilizes a standard 250-sheet cassette drawer and a 50-sheet multipurpose tray for special media types. While the Kyocera Mita KM-1510 isn’t exactly built to address high-speed print and copy needs, it still comes in relatively lacking in this regard. Its 18 ppm is significantly lower compared to other printers/copiers in the market, like Brother’s DCP-7030, which clocks in at a rate of 23 pages per minute. The Kyocera Mita KM-1510 is also hefty at 55 lbs and with its dimensions measuring 19.5"W x 19.6"D x 14.8"H,, as other similar printers weigh about half of Kyocera Mita KM-1510’s weight and a bit smaller in size. Also, other printers carry a standard 32MB memory without any upgrade compared to Kyocera Mita KM-1510’s 8MB, not to mention that its copier memory while optional is still only at 16MB. The Kyocera Mita KM-1510 also lacks duplexing option which is a feature that can be found on similar printers. 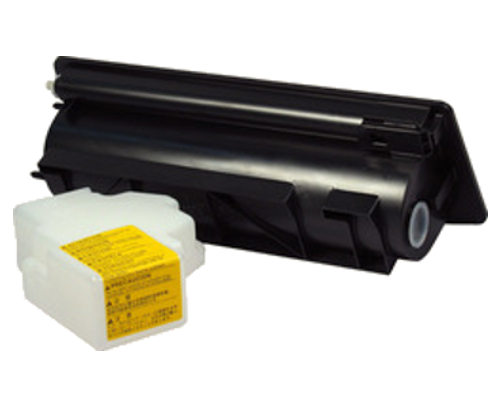 Review it: "Kyocera Mita KM-1510 "
The Kyocera Mita KM-1510 toner cartridges are available 8,400-page yields for monochrome printing and copying at 5% coverage, with compatible replacements carrying a 7,000-page yield, which are quite affordable. Drum unit is guaranteed to last for approximately 100,000 pages. Maximum monthly volume for the Kyocera Mita KM-1510 is set at 15,000 pages, with an average cycle of approximately 3,000 pages per month.